If you spend much time riding trails in the woods you are, sooner or later, going to encounter the scourge of single track - blow down. Sometimes it's possible to ride over, under or around down trees, but sometimes you have to deal with what you get. Here in Idaho where the forests are increasingly stressed from changing climate, the days of clearing trail with chainsaws early in the riding season, then enjoying clear trail most of the summer, are gone. These days it is very likely that one will encounter downed trees every time the wind blows - even a little. One day this past summer, while sawing trail for the Tour of Idaho, I ran a gallon of saw gas through my chainsaw in one section of trail only to discover new trees that had fallen down behind me on the way back out. I actually had a tree fall on my bike this past summer. Be careful out there! For most of us it's just not practical to ride with a chainsaw all of the time - even a really great compact saw like my Dolmar 3410. For years I've ridden with Corona Razor Saws and Sven Saws when I'm without my Dolmar or Stihl. This summer, while working with various trail crews across the state on the Tour of Idaho, I discovered Silky Saws. Once you've used a Silky, there's no going back. Silky Saws are light, exceptionally well-made and cut furiously. 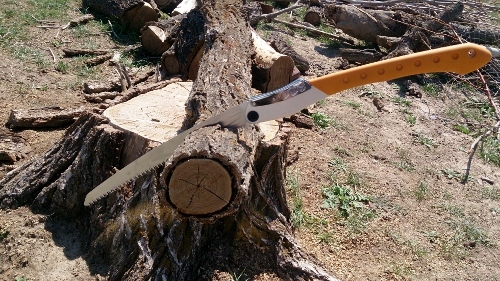 Some of the larger saws cut, for all intents and purposes, like human-powered chainsaws. You need a Silky. 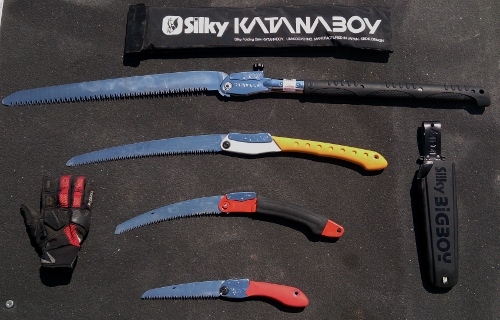 We called the folks at Silky to inquire about obtaining a selection of folding-type saws to evaluate for trail riders. 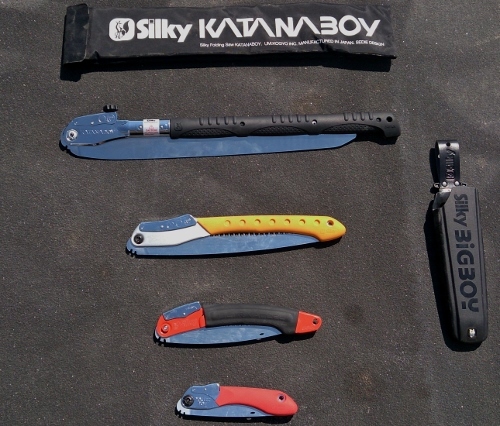 Irene DeMaio, our Silky rep, suggested four saws: the Pocketboy, the Ultra Accel, the Bigboy 2000 and the Katanaboy. We've had these saws in our hands for about a month now and are prepared to render verdicts. All Silky saws are made in Japan with high-quality steel and other premium grade materials. Silky high-carbon steel blades maintain impressive sharpness after long periods of heavy use. The blades are stiff enough for aggressive sawing, but not brittle. Chrome hardening resists scuffing, corrosion, resins and reduces sawing friction. These are serious tools for sawing. The Pocketboy, as the its name implies, is a compact folding saw that fits easily in the pockets of our KLIM Dakar pants and others as well. The blade is 6.7 inches long with 6.8 teeth per inch. This saw resides in my kit that goes out every time I ride. It's about the same size as a Corona Razor saw, but beefier. It's also slightly heaver, but when you discover how well the locking mechanism works, and feel the well-made, ergonomically correct handle as you saw, you understand where the extra heft goes. The Ultra Accel is a slightly larger saw than a Pocketboy. The Ultra Accel features a blade length of 9.4 inches, with 6.4 teeth per inch. 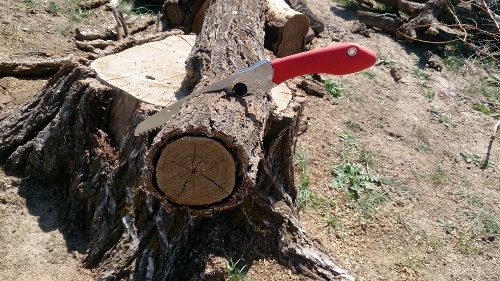 It cuts much faster than the Pocketboy and can handle larger diameter logs. The Ultra Accel is my preferred backup saw for the Tour of Idaho and other trips were two saws are advisable. The Bigboy 2000 is my favorite Silky Saw. It's got a whopping 14.2 inch blade with 5.5 teeth per inch for a very fast cut. It cuts through impressive diameter wood like butter. The only drawback of the Bigboy is that the blade does not completely fold into the handle (see photo above). An accessory sheath (one custom made for the Bigboy is available from Silky) is advised. Even though the teeth are not fully exposed, they are sharp. The Bigboy cuts much faster than the Ultra Accel or Pocketboy and can handle larger diameters. 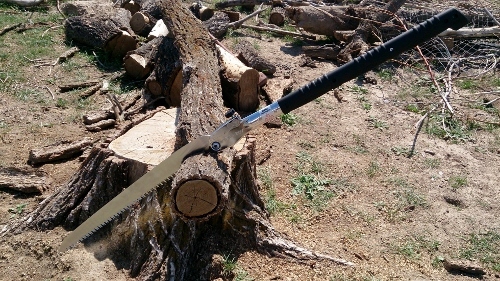 The Bigboy 2000 is the main saw that I carry for long rides in the woods. If you were going to buy just one hand saw for your woods riding, the Bigboy 2000 would be the one. Finally, when you absolutely, positively have got to saw everything in sight, there is the Katanaboy 2000. Forget about superlatives and just examine the facts: 19.7 inch blade length, 4.2 teeth per inch. It's like having a friendly, log-chewing T-Rex at your disposal. Once deployed, it's the most entertainment that you can have with a saw in the woods. I kid you not. MotorcycleJazz.com is pleased to be a dealer for Silky Saws - which we feel are the finest folding handsaws available. This is the first product that we have ever sold through our website (besides tee shirts), and all proceeds go to support the Tour of Idaho. All Silky saws come with a limited lifetime warranty against manufacturing defects. All are available with replacement blades. To order, just the MoJazz Market. Please allow 7 - 21 days for delivery. Yes, we do know that they are cheaper on Amazon, btw. We do offer bulk rate contractor prices for Forest Service personnel, firefighters and others. Email for details. The Good: All Silkys cut ferociously.